We all want to believe that the future is filled with amazing technology, the end of disease, interplanetary travel, and a thriving environment. But the good folks at Bozena Security Systems know that the future is made of armored plating and riot gear. The new and improved Bozena Riot can handle any and all duties when one needs to put down an uprising. At full functionality, it has three components: a carrier, a 3000 kg adjustable shield, and a water trailer. 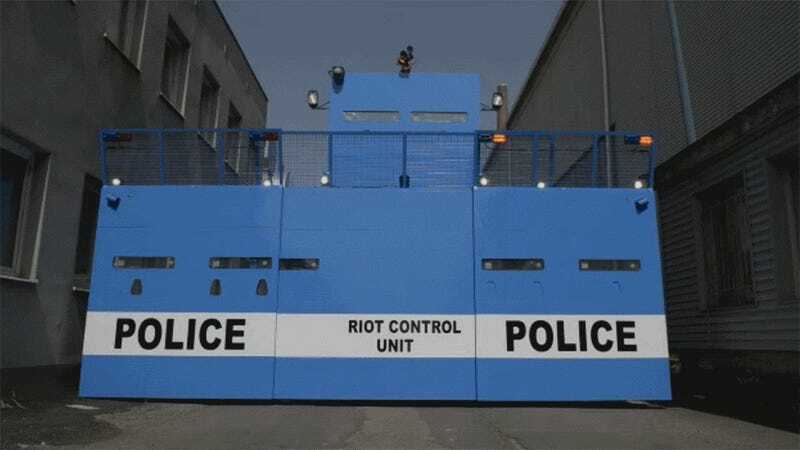 Two water cannons can send protesters flying from the front or the rear and if that doesn’t do the trick, you can always fire up the high-pressure tear gas gun. No driver has to go it alone, though. 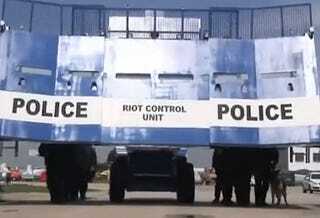 The shield has six launching ports to fire guns or other rubber projectile launchers while keeping the heavily fortified shooters safe and sound. And let’s say that authorities get jammed up in an alleyway like in the GIF up top. Surprise! That shield has bulldozing capabilities to free your buddies and send ‘em crackin’ skulls. Here in the U.S. we just went through a big public debate over the militarization of the police so this probably won’t be coming to our shores right? Well, the combination of an increase in law enforcement spending and Attorney General Jeff Sessions’ pledge to stop monitoring out-of-control police departments seems to set up just the right environment to make it happen. So, whether you fear the authorities that would wield this tank or the situation that would call for such a thing, there’s a plenty of reasons to be terrified for everyone.